Dr. Clifford Hudis is the Chief Executive Officer of the American Society of Clinical Oncology (ASCO). He also serves as the CEO of its Conquer Cancer Foundation and the Chairman of the Board of Governors of ASCO’s CancerLinQ. He previously served in a variety of roles at ASCO including as President during its 50th anniversary year (2013-14). Before moving fulltime to ASCO he was the Chief of the Breast Medicine Service at Memorial Sloan Kettering Cancer Center (MSKCC) in New York City, where he was also Professor of Medicine at the Weill Medical College of Cornell University. In this role he developed more effective treatments for all stages of breast cancer while also exploring novel prevention opportunities. 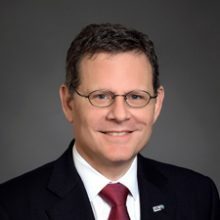 With his move to ASCO his focus is on education, research and promotion of the highest quality of care by the society’s nearly 45,000 members. Key initiatives include the acceleration of CancerLinQ, the society’s focused effort to increase insights and learning from the rapidly accumulating electronic records of routine care provided by clinicians.